One afternoon in early September, the Czech photographer Josef Koudelka was administering a bottle of cognac to a group of well-wishers at the Pace/MacGill Gallery, two placid, spacious rooms on the ninth floor of an office building on Fifty-seventh Street in Manhattan. The occasion was the opening of an anniversary exhibition of photographs Koudelka had taken forty years earlier, during the invasion of Prague by Warsaw Pact forces tasked with extinguishing the Czech spirit of political reform. At the time, Koudelka was 30 and a relative newcomer to his art. He had never taken photographs for the purpose of reportage (his portfolio at the time mostly featured pictures of Gypsies and the theater), but he turned out to have a natural gift for documentary photography. I sampled a glass of cognac and strolled around the gallery. The mood was decidedly midday. Two schoolgirls had piled their satchels and jackets next to the entrance; crayon drawings were scattered nearby. A mixture of Czech, French and English wafted casually throughout the rooms. People lingered in front of each of the eighteen black-and-white photographs on display, most of which are reproduced in Invasion 68: Prague (Aperture, $60), the elegant, well-researched book that served as the basis for the exhibition. A much larger selection of the book’s contents was to be unveiled later that evening in a companion show at Aperture Gallery in Chelsea (open through October 30). Koudelka’s greatest strengths as a photographer are his emotional acuity and narrative sensibility. At Pace/MacGill, there was a shot of two Czech men who look like students triumphantly bearing a bedraggled Czech flag while small fires smolder near their feet. The Soviets, who enjoyed cementing their sense of destiny with monuments to military victory, could not have come up with a more stirring composition. Koudelka’s knack for storytelling is apparent in a photo in which two Russian troops struggle to leave an ambushed tank as a third, his gun cocked, contemplates a nearby Czech who holds his jacket open, daring the soldier to shoot his exposed chest. The most wrenching photo shows a dumbfounded old man standing in front of two singed, bullet-ridden apartment buildings, his eyes as dark as the vacant spaces behind him that were once outfitted with windows. Through a series of underground connections, a smattering of the nearly 10,000 photos Koudelka took during the invasion were smuggled out of Czechoslovakia and shown to the president of Magnum Photos. A year after the invasion, a handful of them appeared in Britain in the Sunday Times. To protect Koudelka, who rightly feared for his safety, they were attributed to “P.P.”–or Prague Photographer. The photos were suppressed in the Soviet Union, but in the West they became award-winning and iconic. It’s easy to see why: the photos spoke clearly to the concerns of a generation. For those who fretted about a cold war suddenly turning hot, the photos expressed the fear of conflict and disorder. To aspirants of radical political change, the photos delivered the message that progress could be suddenly and violently halted. The recent short war between Georgia and Russia gives the photos a renewed resonance–they are stark reminders of how boundaries and lives can be violated by fear and force. Outside Aperture’s building in Chelsea, smartly dressed people gathered in twos and threes, checking their cellphones and taking discreet swigs of bottled beer in the light spilling from the gallery. Koudelka’s photos of samizdat posters had been printed on cheap paper and plastered on a construction barricade next to the gallery door. One of them read “Go home!” in Russian, and features a finger pointing to the right-hand margin of the page. Another figured the Soviet Union as a portly man brandishing a gigantic revolver and the Czech Socialist Republic as a cowering little girl in pigtails. There were more posters in the gallery, but the space was crowded, hot and loud. No one was even pretending to look at the art. Unlike the show at Pace/MacGill, which focused on the destruction and revolt the invasion sparked, Aperture showcases a broader range of the Prague photos. 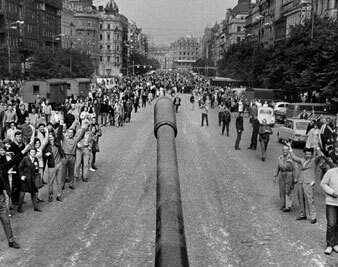 Ian Berry, a Magnum photographer present in Prague during the invasion, remembered Koudelka as “an absolute maniac…who was actually just going up to the Russians, clambering over their tanks and photographing them openly.” Photographs taken from the street chronicle the dramatic first moments of the invasion: a column of tanks thunders down a cobblestone street; a line of people are stopped and pushed to the edges of the sidewalk, and helplessly watch the procession. There are photographs Koudelka snapped while atop a tank, its long nose effortlessly parting a sea of bystanders. And there are photos of the grim denouement of the invasion–one poignant image shows walls once covered with anti-Soviet graffiti painted an obliterating white, signaling the capitulation of the Czech reformers. For all the brutality of the invasion and occupation–there is a lot of smoke, fire and blood in these pictures–Koudelka’s work captures the uncertainty and listlessness of the invading troops. One of the most striking images shows rows of erect Czechs singing to an uneven line of armed soldiers, whose slumped shoulders and loosely grasped weapons convey boredom and discomfort. Another captures a group of Soviet soldiers perched languidly on top of a tank, craning their necks to talk to members of the crowd, who swarm insistently around their feet. Koudelka’s photos expose imperialism with a sullen human face. Koudelka returned to Prague in 1991. By then the Velvet Revolution had ushered in a democratically elected government and the Soviet tanks and troops had been gone for a year. Koudelka now lives in Prague and Paris, but he retains the sensibility of his years as an itinerant exile. In an interview with the Aperture curator, Koudelka reveals that his favorite word is “next”; as he describes it, the word implies “moving, continuing, never stopping.” As I squeezed my way to the exit of Aperture, through the crush of the crowd, Koudelka scampered by, flushed and sweaty. He seemed eager to meet whatever might happen next. Megan BuskeyMegan Buskey is a writer based in Brooklyn, New York.